The OnePlus 6T is getting a new color option. 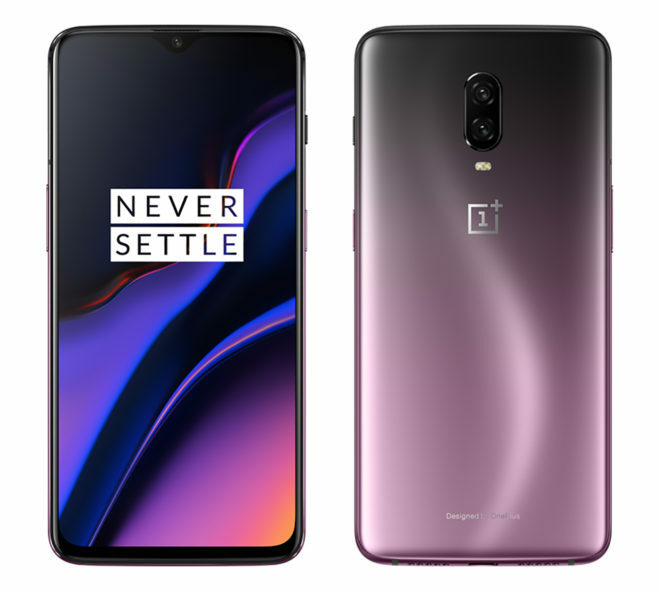 OnePlus will launch the OnePlus 6T in Thunder Purple in North America and Europe on November 15. This purple handset will include 8GB of RAM and 128GB of storage, and it’ll be priced at $579. OnePlus has confirmed to me that the Thunder Purple OnePlus 6T will only be available through OnePlus.com, meaning you won’t be able to buy from T-Mobile. The model sold by OnePlus is fully compatible with T-Mo, though, so you don’t have to worry about losing support for LTE bands or something like that. You can read up about the differences between the OnePlus 6T sold by OnePlus and the model sold by T-Mobile right here. After launching in Mirror Black and Midnight Black, it’s nice to see a new, brighter color option come to the OnePlus 6T lineup. A purple phone isn’t going to be for everyone, having more color options is always a good thing, and the rear panel that starts out a light purple and then uses a gradient effect to transition to a darker color is a neat effect. A “Thunder Purple” TPU case for my T-Mobile OnePlus 6T would be nice. Wish I could have it but that’s not happening unfortunately. inI fine with my shiny black OnePlus6t it’s only my bacjuo handset to my industry leading #Note9. Same here I’ve had Galaxy phones currently have the note 8 but I wanted to give this a try and I been using it since Thursday so far the experience has been nice I just miss the better display and wireless charger. Oh look, another cellphone. Be still, my beating heart. You sure you’re on the right forum here, pal? Absolutely. The world needs a new cellphone like a fish needs a skateboard. Wonder when they can release the software updates they are behind on. T-Mobile version is on 9.0 while the non-TMO one is already on 9.0.5, having pushed out two updates after release version. 6T from TMO is still on security update from September. However, yeah prioritizing a new color seems like the right thing to do…sigh. Btw, other than TMO being slow and non-communicative, the phone itself is amazing! Amazing phone, it’s one of the best phones I’ve used so far and I’m not sure ahabo everyone else but I get almost 3 days of battery life it’s insane. I personally wouldn’t want a purple phone but am happy with my back up shiny black. I think I’ll wait till next year to break it out, fresh for the summer maybe, my note 8 is still new. I had to get it the 1st day with the trade in for the s7 edge, $280 was to good to pass up. I had a nexus 6 laying and got 300$ I only payed 150$ it was a fun good deal. I still got my Note 8 there and I’m giving this a try, sure I miss the better display and wireless charger but so far have been enjoying something different.